Lab A Dab A Do! Block Playground: A work in progress in which you can create blocks, roller coasters, and make custom games. The block world objects obey the laws of physics. At this point the user interface and instructions are not finished, and there are bugs. Big Bad Bugs. May lock up your computer. Be prepared to reboot. Shockwave 10 required. These online activities can be used in classes, on students' laptops for "anytime anywhere" learning, or to extend classroom activities into students' homes, so that parents can get involved and students can work with the material on their own outside of school. Many applets have teacher-customizable content which can be modified very easily by updating text files which contain problems, numbers, words, help files, challenges, etc. that are automatically incorporated when the applets run. More information about Lab A Dab A Do. A more fanciful and graphical entry point for kids, which does not contain all of these applets. Sentence Builder (in progress)--please contact me for more info. A talking word processor which is teacher-programmable, presenting a set of words which students can use, or add their own, to build sentences. The teacher version allows programming of the supplied words. A Talking Picture Book which is teacher-programmable. Kind of a do-it-ourselves version of Clicker. Google Maps Database API demos: World of Songs (click on a flag to see the info, however the songs themselves not available), Henry (a picture of our national genius pops into the info window when you click on the map flag near Walden Pond). Flash Courses in both animation and programming using Actionscript. Flash 6 Home Page. Virtual Squid: Dissect a squid without all the mess. Rods-an implementation of the Cuisenaire Rods. It has a "snap" grid of unit dimensions, a Glue tool to join rods, a Chisel tool to break a rod into smaller ones, and a Musical Ball tool--drop it at the top of the grid and listen as it makes sounds when it "strikes" the rods as it falls. Number House Rods-use rods to make as many different combinations as possible to make a given number, and write corresponding number sentences. Rod Trains--create Rod trains, experiment with multiples. Has some new commands like "multiply" and "erase an entire row". The daily challenge is easily updated by teachers by modifying a simple text file. Rod Balance Beam--In this activity, students hang rods on a balance beam. The number of "hooks" is programmable, and it incorporates unknowns, and can thus be used with a wide age group. For younger children it's a rod exploration tool, and an addition machine. For older elementary school kids it's a multiplication machine. For middle school it's an algebra simulator. Rodney--Bendable, shapeable stick figure made of rods. 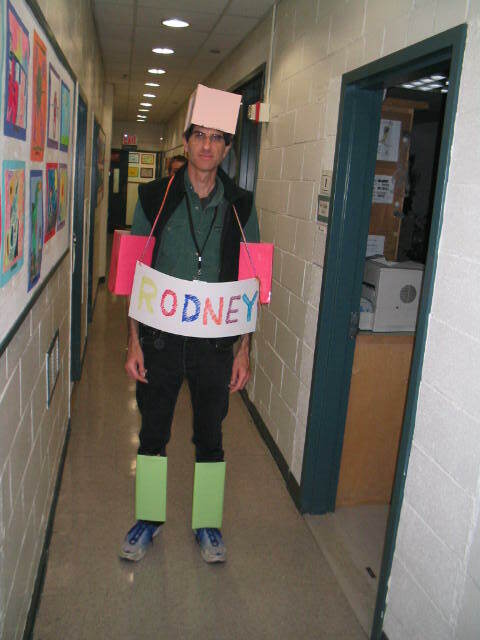 Will the REAL Rodney please stand up? New Rodney: Rodney animates! This is a key frame animator which stars Rodney. tenTris--a variation on Tetris which requires that users combine two tiles that make ten. Powers of Two--graphical representation of the powers of two. NumberTable--draggable resizable table of numbers. Employs and demonstrates "skip counting" and uses sounds to mark two different skip counting frequencies. Automated Charting Activity A form which allows users to enter data and automatically create charts--bar, pie, etc. Papy Computer--an partial implementation of a binary/decimal hybrid calculator and math activity. Particle World--a simulator for particle physics, electrostatic forces, gravitation, and wacky fun, created by a colleague in Sweden. 4 Triangles--Students rotate and assemble four triangles into as many different shapes as possible. There are 14 possible distinct shapes. After assembling a group of four, students can rotate and flip that assemblage to see if it is really different from the other assemblages they have created. The borders of the individual triangles can be turned off to focus attention on the overall assembled shape. Cricket--a sentence builder with talking features written in Director, so you need to have or install Shockwave to play it. It allows young students to construct and edit sentences in a "prompting" word processor, which can "speak" words and phrases, and also shows images of any words in the "pick list". Word Wall--Every Kindergarten and First Grade class has a word wall. This online version can be updated by teachers by editing a simple text file. It incorporates a digital photo of any classroom's word wall as a background. Spelling Patterns--This is for combining letters into words. It reads up a simple text file which lists the beginning and ending parts of words, and a dictionary created by the teacher. Vowel Volley--This is a word game based on a paper-based activity created by Trevor Day School's second grade teacher, Mr. Soloff. Poetry Magazine--An online journal of Lower School poems, which uses an online submission form and a database to store and display student poems. RotoPaint--These are rotating spirals you can draw on and modify. Online Art Activity--Rotorelief. Based on an art project by Marcel Duchamp, these activities let students experiment with three dimensional illusions created when art is designed to be displayed on a spinning disk. Clock and Giffy Clock--A first pass at an all-school clock project, in which students design their own clock face and hands. Trev O Phone A xylophone with eight notes, and a simple but effective way to score and edit music. Trev O Phone2 Now updated to have two voices. A xylophone with eight notes, and a simple but effective way to score and edit music. Visual music composition programming activity--a musical composition and scoring program which doesn't use a traditional staff and notes. Sound Sequencing CodeSkill In this activity, students can arrange the tiles to create a sequence of sound effects. ChalkLetters--Based on a chalkboard and "frog jump" method for teaching capital letter formation, this applet provides a virtual chalkboard. It prompts the student to draw a letter, and implements a "help" animation which shows the proper way. WoodLetters--Based on a manipulative used to teach letters which consists of two straight and two curved wooden shapes which can be combined. LetterBug--A fun handwriting activity. Students draw letters freehand and a bug follows the path of the letter. LetterStretch--A fun way to play with letter forms. This activity shows how malleable our letter shapes are, ie they can be stretched and skewed and still be recognizable. This is an exploration of the essential properties of the shapes and strokes of each letter. Squinch--if you have to ask, don't, just do it. Typing Game--a very prototype of a simple "falling letters" typing practice game. This may be improved to include other types of games like "asteroids" for typing practice at various grade levels. Some mechanism for keeping track of students' progress may be added later. This does not try to replace a professional typing program like Mario Teaches Typing, but rather produce a variety of practice games. River Kayak Typing Practice Game--navigate your kayak past the rocks in the river. Steer it by hitting the keyboard keys shown next to the kayak, but watch out because those keys are constantly changing to other letters to give you practice in typing. Partially complete.